Belgian teams Omega Pharma-Quick Step and Lotto-Belisol are both counting the cost of the late crash in the first stage of the Vuelta al Pais Vasco that split the peloton and left less than 50 riders to contest the finish. While relatively few riders actually came down, as the peloton approached the top of the final climb with just over seven kilometres to go, both teams saw their team leader hit the ground, while Omega Pharma-Quick Step lost a key rider. 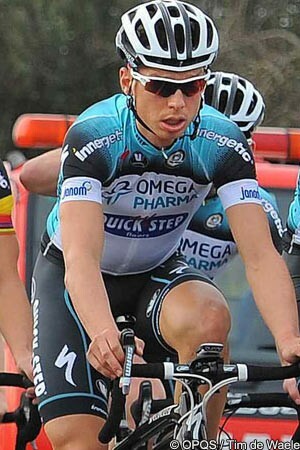 Omega Pharma-Quick Step’s Dries Devenyns abandoned the race on the spot, and was taken to local hospital where he was diagnosed with a fractured radius bone in his left arm. "I was there in the first position, but in a certain moment [Lotto-Belisol’s Jurgen] Van Den Broeck crashed in front of me and I couldn't avoid him," said Devenyns. "I went to the ground, and we were also going at a high speed. Now I have this fracture of my left arm for a third time. I am not really lucky with these kind of things in my career. “It is really a shame because the condition was good and I was looking forward to the Ardennes Classics,” he added. “Now I have to stay calm, as there is nothing I can do. I can only recover as best I can." Van Den Broeck himself managed to continue, but was suffering from pain in his right elbow and knee. The Belgian was nursed to the finish by Dutch teammate Dirk Bellmakers and, although initial examinations showed no fractures, the Lotto-Belisol leader lost more than five minutes to the front group and have to wait and see if he will be able to continue the race. Devenyns’ Omega Pharma-Quick Step teammate Tony Martin was also taken down by the incident and, although he managed to remount and lose just 28 seconds at the finish, damaged the left wrist that he fractured during last year’s Tour de France. The German was also taken to the hospital after the stage, where no fractures were found, but he may have to be examined further in the days to come. "We were riding in the first part of the peloton and I only heard the noise of the crash and suddenly we were laying on the ground," said Martin. "There was immediate pain in my left wrist and I thought maybe it was the old fracture of last year during the Tour de France. But the first thing was to get to the final and not to lose too much time, then to see at the hospital if there were any fractures. “Fortunately, the results seemed to exclude any fractures,” he added. “So, it's more important that I am OK, than the fact that I lost time."